2 nights stay for 2 people. 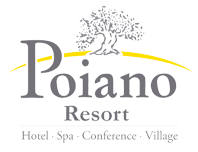 1 entrance per person to Poiano La Spa Wellness Path for 90 minutes (salt water lagoon, sauna, hammam, emotional showers). 1 massage per person of 30 minutes to be choosen from our menu. 1 yoga lesson for 2 people. Easter lunch (drinks not included). Package price: from € 179.00 per person.